This Jamie Oliver Greek cake is very versatile and can be tweaked according to taste. It needs a LOT more syrup than the recipe indicates – I actually made a second batch and soaked the cake when it was cold, before serving. Grease and line a round baking tin with baking paper. In a mixer, whisk the eggs and sugar until thick and pale in colour. Add the yoghurt and zest of the citrus. Gradually add all the dry ingredients and combined well. Now incorporate the olive oil and mix. Pour into the tin and bake for 35 minutes or if pierced with a skewer it comes out clean. Remove cake from the oven and pierce all over with a skewer. Add walnuts, pistachios, raisins, honey and orange juice to a pot and bring to the boil. Pour all over the cake and cool slightly before serving. 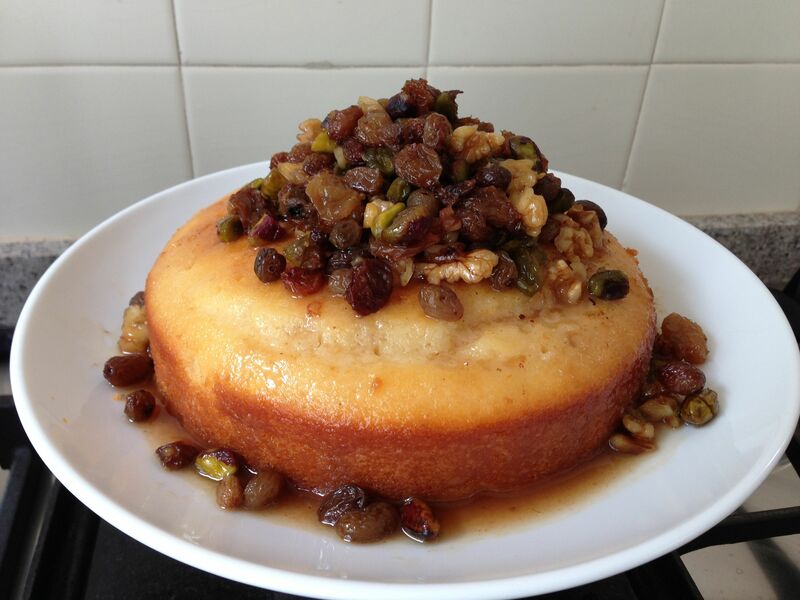 Posted in Cakes, Dessert, Jamie Oliver, Sweet Food and tagged Greek yoghurt, honey, pistachios, raisins, semolina. Bookmark the permalink.